The Old Course Experience - Scottish Golf's Ryanair? It's an old hobby horse and it's not going to be resolved just because we flag it up again and anyway it suits enough of the big players in Scottish golf tourism as to not "needing fixed" but for the rest of us or for the consumer it really does stick in the throat a little. Yes, it's "Old Course Travel Trade Tee Time" charade again - the one where tour operators from across the world are given exclusive access to tee times on the Old Course if you only have a mximum of eight golfers, have the lead name in place, have the money to pay the full fees up front, can ensure that the clients details won't change, and only if the tour operator has accommodation in St Andrews. Oh yeah and in exchange for these restrictions it will only cost you £1602 per fourball and you'll have to pay all of your tee times up front by November 30th this year. How this arrangement has escaped the scrutiny of bodies such as the Office for Fair Trading or even not be roundly condemed by the golf loving First Minister or VisitScotland is a mystery. Probably however a political mystery. It is not good for golf tour operators. It is not good for hotels outside of St Andrews in the rest of Fife and beyond. It is not good for Scottish Tourism. It is not good for the consumer. It is good for the corporate big boys however and the Links Trust. Ah for a bit of inclusion and Olympic spirit eh? Here is the full termns and conditions for all you cash rich independant tour operators and golf promoting agents all over the world. Via e-mail from Monday 1st October until Friday October 12th to traveltrade@oldcourse-experience.com Applications received before or after this time will not be considered. Each application must clearly state the name of the lead golfer or booking reference, the total number of golfers and the dates that they are able to play the Old Course. Tour Operators making a number of applications may send all their applications as an attachment on one e-mail. The maximum number of golfers per application is 8. Please note that Travel Trade tee-times are sold in 4-balls only. Successful applications will be notified by Friday 2nd November. Full payment must be made by Friday 30th November, otherwise tee-times will be released automatically and the reservation cancelled. The payment is non-transferable and non-refundable. If you request a range of dates this may improve your chances of success. Please note the Old Course is closed from May 6 – 9, July 29 – August 5 and September 9 – 30 inclusive for tournaments. The price for 2013 Travel Trade tee-times is 1620 GBP per 4-ball (405 GBP per golfer) inclusive of VAT – including one round on Old Course and one round on New or Jubilee course. If golfers wish to upgrade to the Castle Course the supplement is 65 GBP per 4-ball. If you are unsuccessful, applications will not be held on file. Applications for cancellations will be accepted in the same way on Wednesday 9th January 2013. Travel trade times are allocated for tour operators to package with accommodation in St Andrews and sell to golfers. They are not intended to be re-sold or exchanged as “tee times only” to other tour operators. Any operator that re-sells times in this manner may be excluded from the application process for the following year. We look forward to welcoming many of your clients to the Old Course next season. 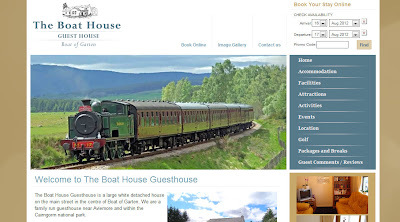 Our Open Room Lite web development package which includes the full integration of online reservations and social media sharing has been selected by another Highland Guest House as the way forward. 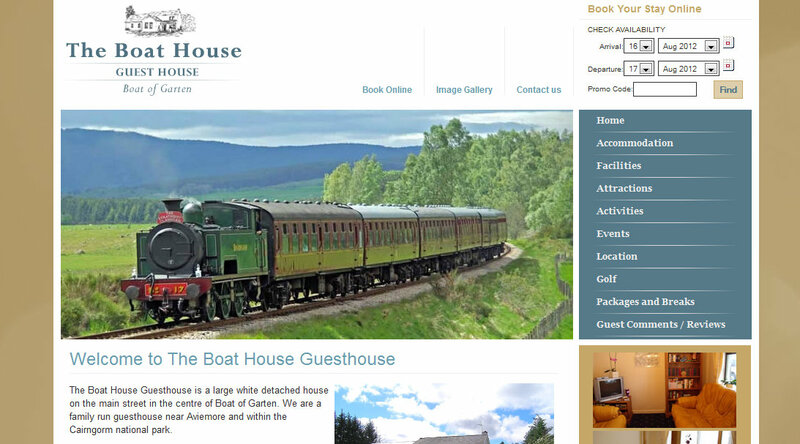 The Boat House Guest House in Boat of Garten in the Scottish Highlands went live this week with an all new website and booking engine to replace the VisitScotland web in a box version they had previously been using. The Open Rooms Lite package was specifically designed with small independent operators in mind and can come with or without the booking engine providing full content management, social media integration, site optimisation and highly personalised design. When designed properly there is no reason why the independent operators can't have the highest level of content and destination management information to inform and entice their guests to the area and to their property. Plan B believe that the new Boat House Guest House website achieves both. I think all blogs should be written as freely and openly and as professionally as For Argyll. You just visit it for a couple of minutes a week and find them saying it as it is. It is so much more refreshing reading independant local opinions without fear or favour. They have been at it again with the following article on Brave late last month. Local and regional cinemas in Scotland have had a communication many assume is from or via VisitScotland, the national tourism agency. This has led them to understand that they ‘must’ screen the film Brave as a matinee every day over two weeks, whether or not it attracts an audience. We have had complaints on this from some cinemas beyond as well as in Argyll. In some cases the instruction is impacting on planned showings of local interest. The cinemas have been told that VisitScotland has a substantial investment in the enterprise and that local support for it is important. The Disney Pixar animation, Brave, has £7 million of VisitScotland’s (our) money invested in a marketing campaign aimed at using the film to attract overseas visitors to this country. Why therefore ram it into Scottish local cinemas. ‘The directive will be with the distributor of the film to organize cinemas viewings in their entirety. VisitScotland’s involvement extended to the premiers. So what on earth is the purpose behind this heavy handed and apparently not entirely straightforward move? Is the film distributor hoping to justify VistScotland’s multimillion pound commitment by convincing it that, even at home, local cinemas cannot wait to get their hands on it? Is the imperative to persuade taxpayers at home that Brave must have gone viral because it’s also on their own doorsteps? Or is it an attempt to arouse nationalist sympathies by getting this film out there at all costs? If it is the latter, the attempt to sell Scotland to residents in Scotland through this film is as likely to misfire as to succeed. We have seen the advance clips as television and YouTube, as have many. The sight of a fat, bearded, cartoon kiltie bending over, flipping the back of his kilt over his head, baring his (mercifully) unseen but inevitably hairy buttocks and roaring ‘Feast your eyes’ – and a clutch of simpleton teuchters apparently short of the full merk – may appeal to third form humour but does not augur well for a home audience’s discriminating response to the film. We’re keeping an open mind – a constant struggle, we admit, as the clips offer little encouragement – and will review the film when we get to it. This is obviously now going to be at a matinee near-ish to home. This seems a pretty maladroit move from the film distributor and it is a local irritant to VisitScotland’s reputation. Scots don’t warm to ‘being told’. Let’s hope the marketing behind Brave does not prove to be a £7 million misdirection.